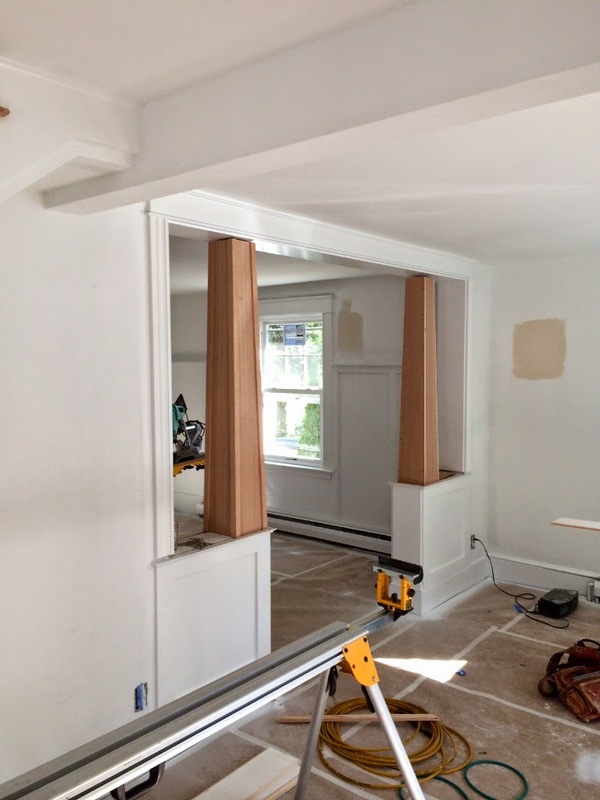 One of the big design elements between the Living Room and Dining Room are the Colonnades. They're a classic Craftsman feature and they're one of the first design elements we wanted to build. First step - Kyle needed to trim out the opening. 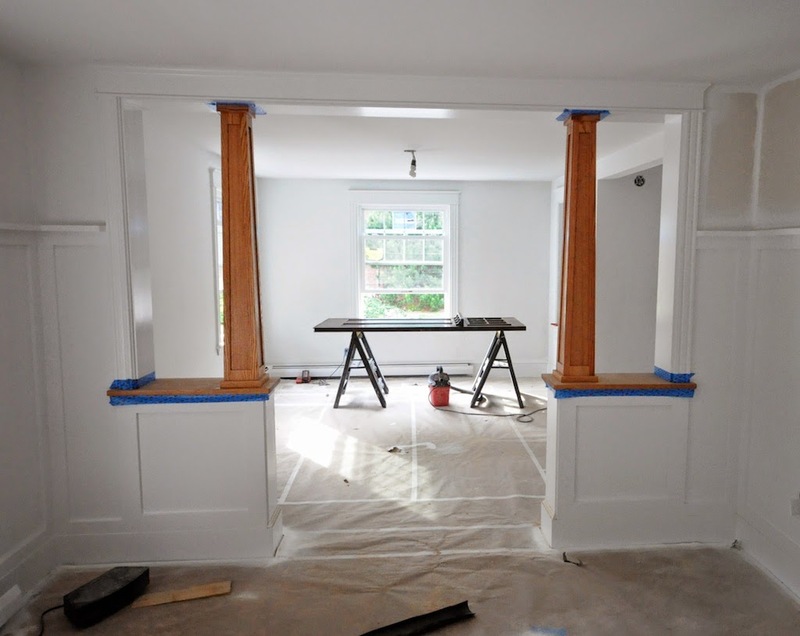 We were able to reuse the original moldings for the vertical pieces and created new matching trim across the top. 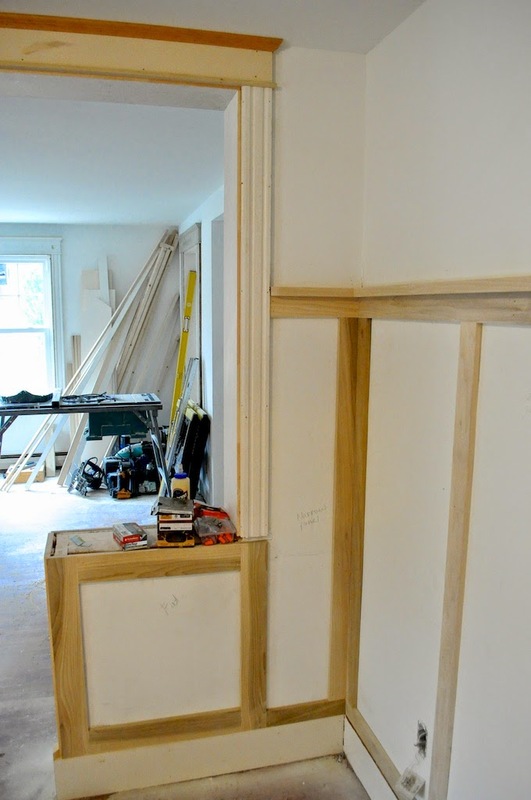 We used the same wainscot detail on both sides of the opening. Next we need the columns. We're making them of quarter sawn oak. 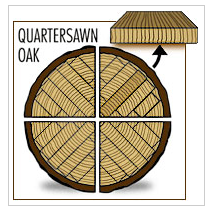 As a quick primer - quarter sawn was a popular way of cutting lumber in the late 19th and early 20th century. It results in wood that has a beautiful grain, is stronger and more stable, with little warping or twisting. Have you ever seen a quarter sawn floor? They're incredibly hard and beautiful. But cutting wood this way reduces the yield, so it fell out of favor as modern practices were utilized. This is a tricky carpentry project. There are a lot of compound angles to contend with. But Kyle was up to the challenge. We laid them out 'to scale' with a drawing on the floor. They looked great and we were very pleased with the proportions. 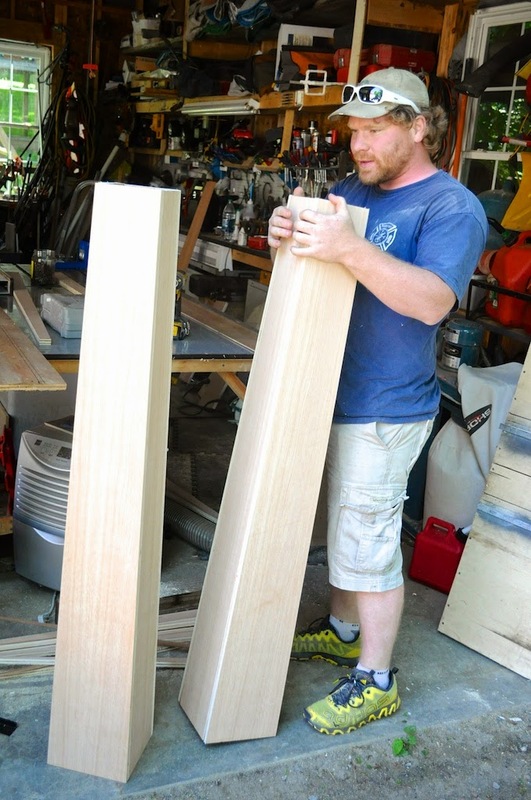 Kyle went back to the Waterhouse Builders shop and started putting them together. 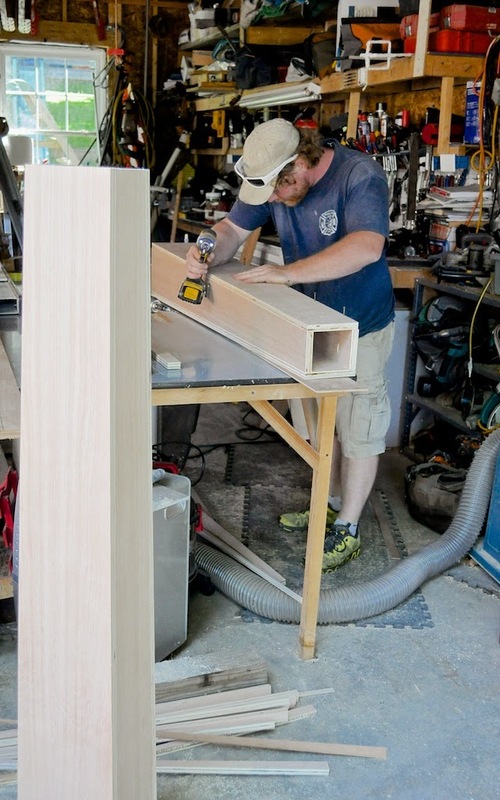 He started with the basic column and then glued, screwed and finished nailed the surrounding frame. They were very well made! and I hated them. Really, really hated them. While they looked really great in a 2D drawing, when you saw them in 3D, the mass was just way too big. I kept trying to like them, but they looked like parts from a much bigger house, the proportions didn't work. I even tried giving it another day, for them to grow on me. But they were just wrong. Sooooo, as much as we hated to do it, it was back to the drawing board. Literally. We scaled them down and Kyle got to make them all over again. But this time, we loved them. What a difference it makes, getting the proportions right! 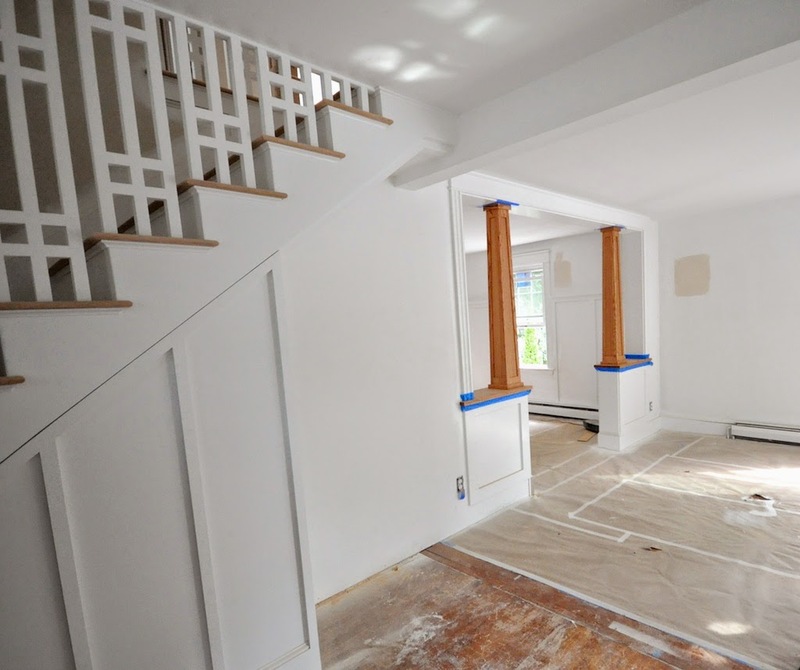 Next up - finishing, flooring, paint & more! I agree, the first set were heavy and wide and took away from the opening. The scaled down version looks so much better and compliments the opening. Good eye. Ditto. Loving this house. Nice job....excellent craftsmanship. I admire your quick decision to go back to the drawing board. You were absolutely right. It would have taken me a lot longer to admit they needed to be reworked. Beautiful job! And of course this adds to your cost, right? But you guys still did this start-from-scratch-all-over-again thing to make it right. 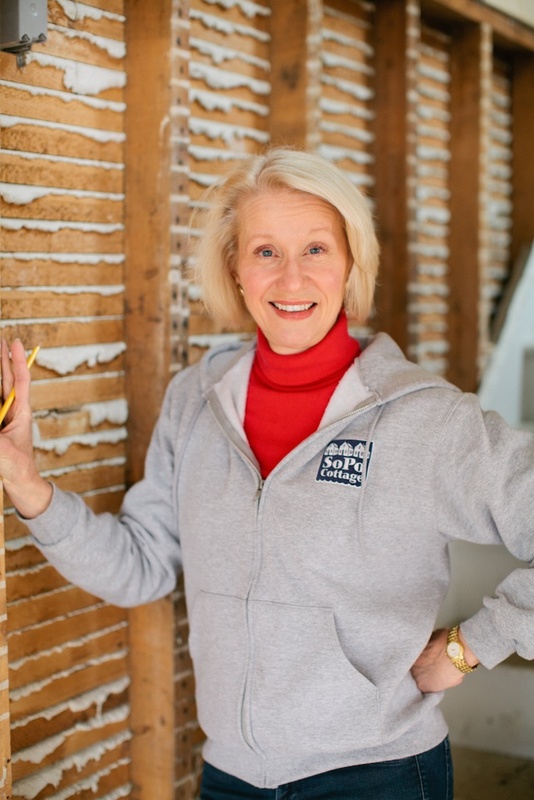 That sort of thing demonstrates your love and passion for houses.and separates you from flippers out there -- NO flippers out there would do the same! The new set looks beautiful. Great decision.